It’s every family’s dream — chores completed both efficiently and effectively. And while our family hasn’t achieved that dream yet, we have found a method for organizing chores. Does it sometimes feel like your child’s moods are controlling you? Have you ever been embarrassed in public by your kids’ behavior, but weren’t sure how to handle it? Do you long for a more calm and peaceful home, without yelling and fighting? This is the book for you! In “Temper Your Child’s Tantrums,” parenting expert Dr. James Dobson offers the essential keys to correcting a child in a firm, loving, and understanding way. Every parent has moments with their kids that they wish they’d been better prepared to handle. If they’d only known. This cleverly designed book published in conjunction with Focus on the Family shares heartwarming and vulnerable experiences from well-known moms and dads. Readers will love the upbeat, surprising, sometimes humorous stories of their toddlers, grade-schoolers, tweens and teens. 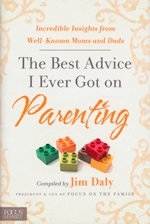 Contributors include Kevin Leman, Tim & Darcy Kimmel, Vicki Courtney, Stormie Omartian and other leading Christian parents.